Hi wondered if anyone on here could help or have had a similar problem? I have been having lessons all winter with a dressage instructor and been riding in a very simple happy mouth jointed loose ring which is great as we all know arabs do have small mouths and some of them struggle with lots of metal etc! I usually show in a vulcanite mullen mouth pelham which i rode him in the other evening and i am now wondering if this is too much for him...he didnt go badly but i cant help but wonder if there is a'kinder ' bit ? can anyone recommend a bit that has worked for a horse that isnt particulary a fan of having things in his mouth??? perhaps that is sensitive or can be a bit fiddly? I always used to show my boy in a rugby, but then i was told by a producer to only use a "normal" pelham as it looked tidier? I had a bit fitter/adviser once, the problem was the pony would take off and I had problems stopping her. He suggested a narrow mullen mouthed rugby pelham with a martingale, it worked perfectly in getting her out of the habit and I was able to return to a simple rubber bit (or none at all). His remark that an Arab can go full speed with their head up or down amused me. Lily goes really well in a narrow mullen mouthed rugby pelham, found out by accident when I bought her a second hand double bridle. For the first time since I owned her she stopped sticking her head in the air with her mouth open to evade the bit, and I had tried a happy mouth mullen mouthed snaffle,jointed eggbut snaffle, KK sprenger lozenge loose ring snaffle, and a Dr Cooks bitless bridle (which she went well in until she got sweaty when she tried to rub it off). I was surprised she liked the pelham so much, but think it is because she doesn't like jointed bits, and hasn't got room for a thicker bit. This is Lily's. She prefers the Rugby pelham to a normal one I bought her with the same mouthpiece and a Kimblewick which I tried because I only wanted to use one rein for endurance. I always have a loose curb chain. I think the Rugby pelham going to the ring rather than straight to the bit must have a subtly different effect to the standard pelham. I use a rugby pelham,generally I ride in a french link but when a pelham is needed I was using a happy mouth. My dentist told me that the happy mouth may be too bulky for my arab as she has a fleshy mouth and although I thought that the kinder pelham would be the happy mouth she's actually more comfortable in the rugby pelham. SP - I use the NS pelham with a lozenge with Dulcie - very neat and she goes very well in it. She is hard to please on the bit front! If you can, get the same mouthpiece in standard (not show or rugby) pelham shanks - with a soft curb it will ride just like your snaffle. Rugby Pelham works fine on my arab, goes very well in as nt to much in the mouth. 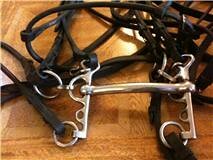 Neue schule do a snaffle mouth piece with pelham ends, I was going to try one as Arabi loves his starter snaffle. No problemo I will bring it along! Actually found a double very successful for showing my small mouthed arab. You have to look hard for them but you can get lovely neat small ones, normally found at showing specialist stands/ online rather than the chunky types you get in local stores. I hate eggbut joints so have mine as a french link. And yes have also used a rugby successfully with another horse but not shown in it as use a double with her for that. I would try a Tom Thumb Rugby Pelham, thats what I used and it worked well.